[…] the medium of keeping the whole in one connected system, giving to the subject such opinions as a recent previous excursion up the river would allow, and such personal inspection and co-operation as might appear necessary, and as were consistent with my other avocations. Fox’s “other avocations” included being Chief Commissioner of the Board for the Promotion and Extension of Public Works in Ireland, what we now call the Office of Public Works. By 10 December 1831 Mudge had reported on “the present State of the Navigation of the Shannon from Limerick to the Sea” and ten days later he submitted, from Limerick, his report “on the want of Piers and Wharfs at Tarbert, Kilrush, and Carrigaholt”. 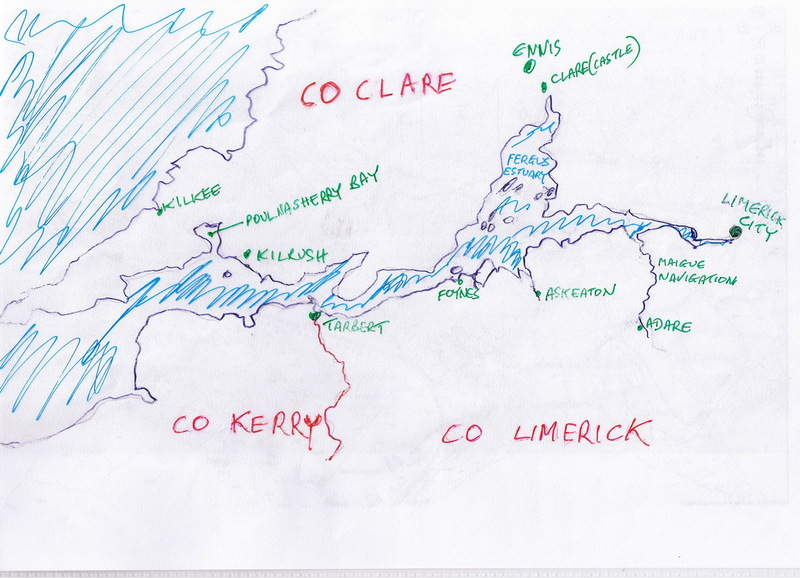 Here is a rough sketch of the Shannon Estuary. 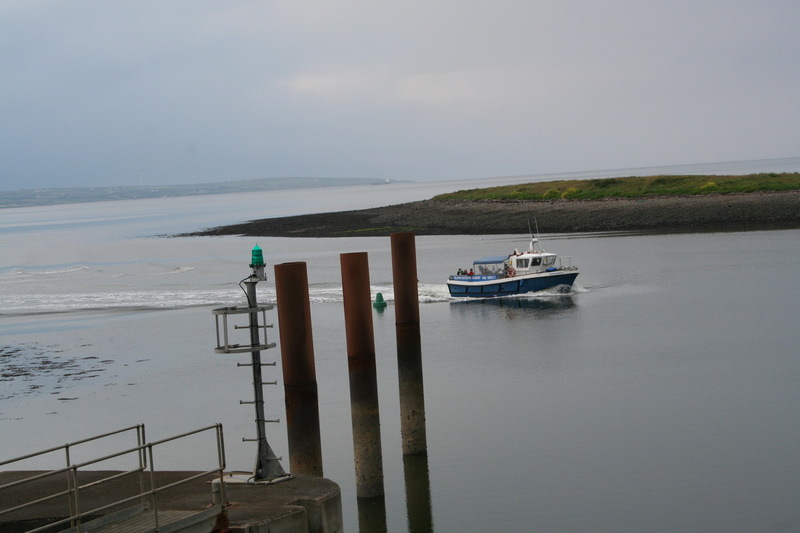 Steamers were already operating on the estuary, travelling from Kilrush, via Tarbert, to Limerick. They towed lighters carrying cattle and other goods. 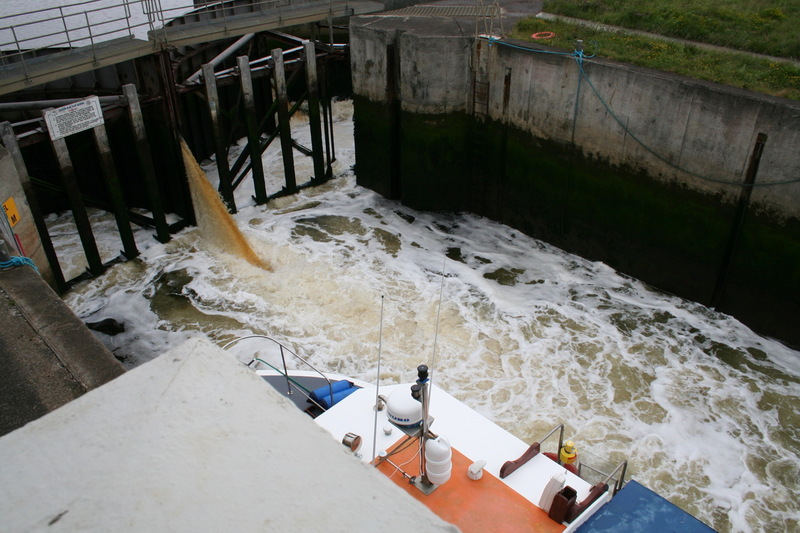 However, there was a large fleet of sailing boats, often called turf barges: although they also carried other goods, they took vast amounts of turf from Poulnasherry Bayto Limerick and to other places on the estuary. 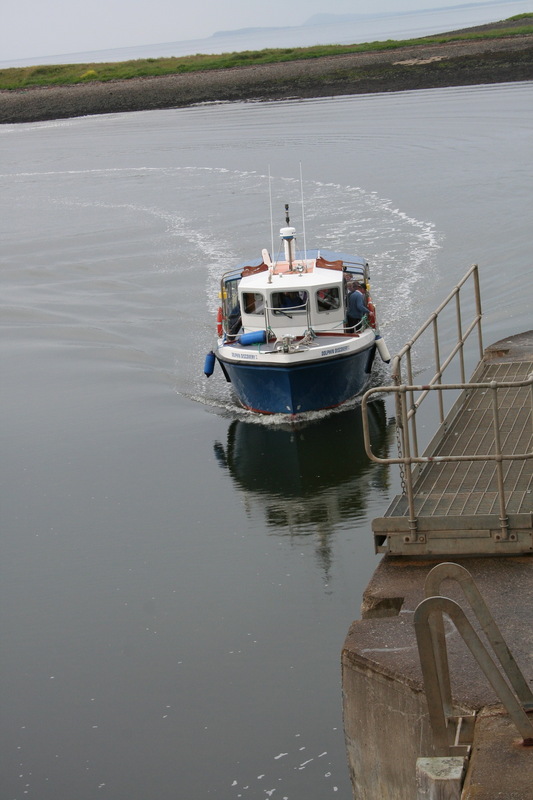 Boats returning empty picked up limestone for making lime as fertiliser. 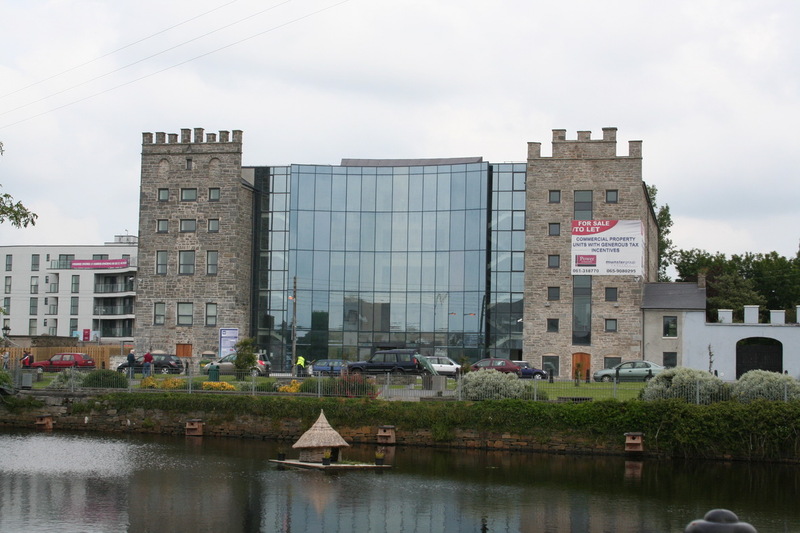 Other goods carried to Limerick included butter, corn, peas, potatoes, feathers, dried fish, wool, pigs, oysters, sheep and goat skins, ox hides, calf skins, tea, coals, stockings, yarn and eggs: Limerick City Corporation taxed all those items. 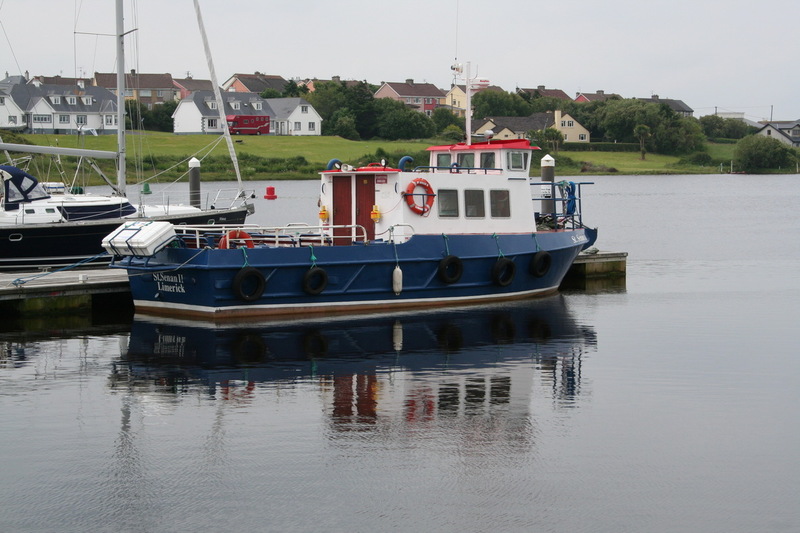 The harbour of Kilrush lies on the Shannon, seven miles below Tarbert; it is a dry harbour, and has a bar of sand and rocks extending across the mouth of it, which in my opinion is sufficient to preclude the possibility of making the harbour navigable, even at half tide. If the bar were cleared away, I think, the mouth being open to the south-west, the southerly gale would continually fill it up, and the expense of dredging up the sand and shingle so thrown up would be very considerable. 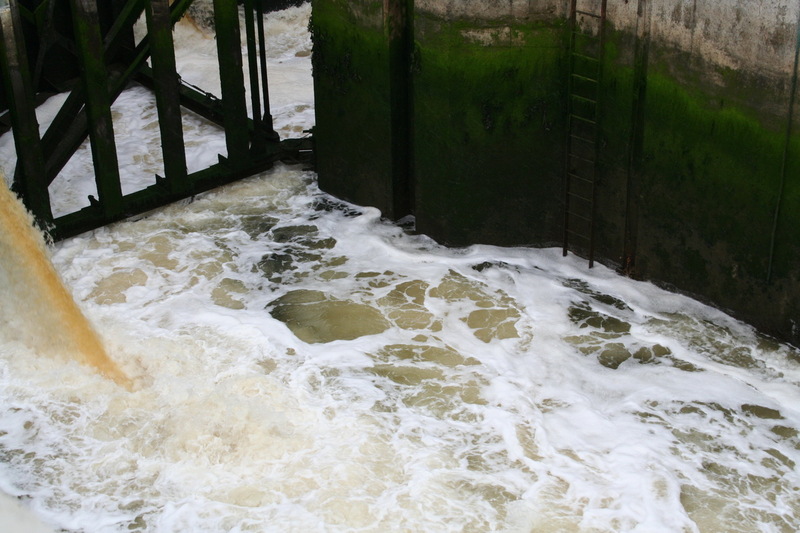 But this is not all that the harbour would require to make it useful, for it should be deepened several feet, so as to secure five or six feet of water more than a vessel would draw, to go over the bar at high water in blowing weather; at present, with a south-west gale it is entirely exposed, and from the shallowness of the entrance, the sea would preclude any vessel getting either in or out. There is a custom-house and some storehouses situated on the north side of the harbour, but I am not aware if they are of any service. 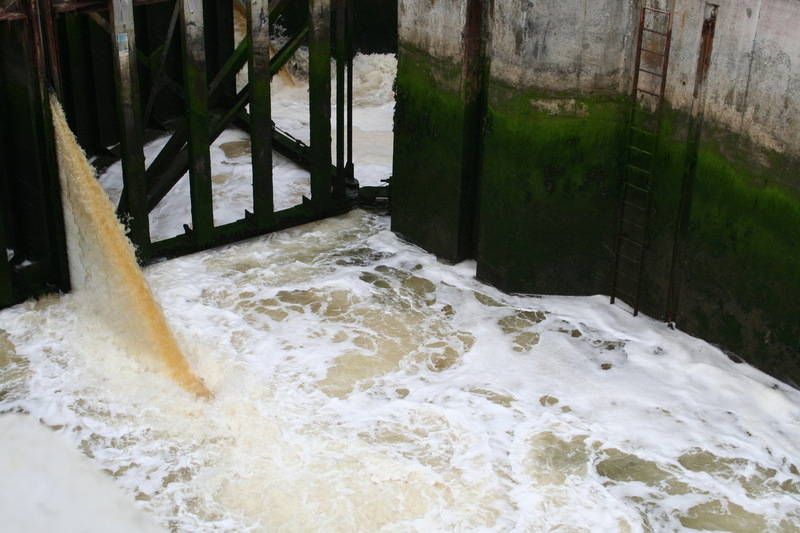 The place is frequented by a few vessels from 100 to 12o tons, which ship off cargoes of grain to various parts of England, but owing to the shallowness of the harbour they are generally detained a considerable time, if they allow the spring tides to pass without taking advantage of them to go out. I do not think from what I have seen that any capital could be expended on this harbour likely to be of general utility; all that can be done for this place can be easily accomplished by the proprietors, who derive immediate benefit from the trade and have an interest in the harbour. 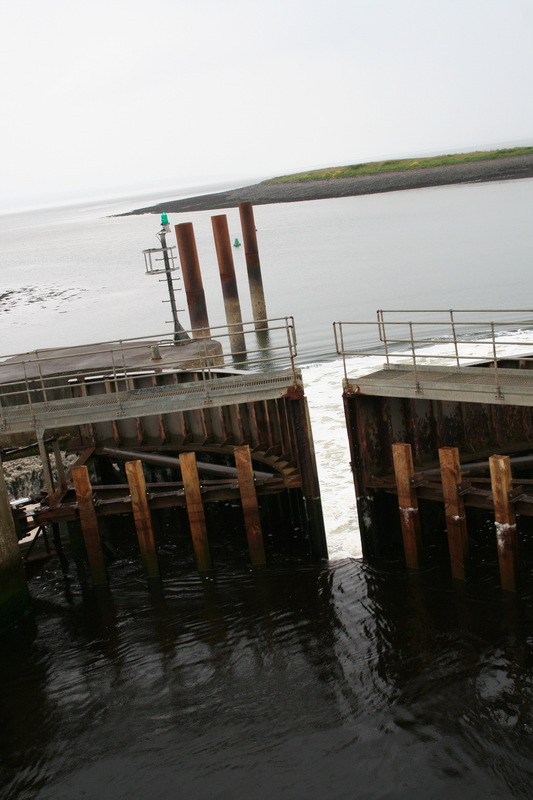 There is a pier extending from the shore at Kilrush towards Hog Island, a part of which was built by the Board of Customs, but it did not extend further than low-water mark. 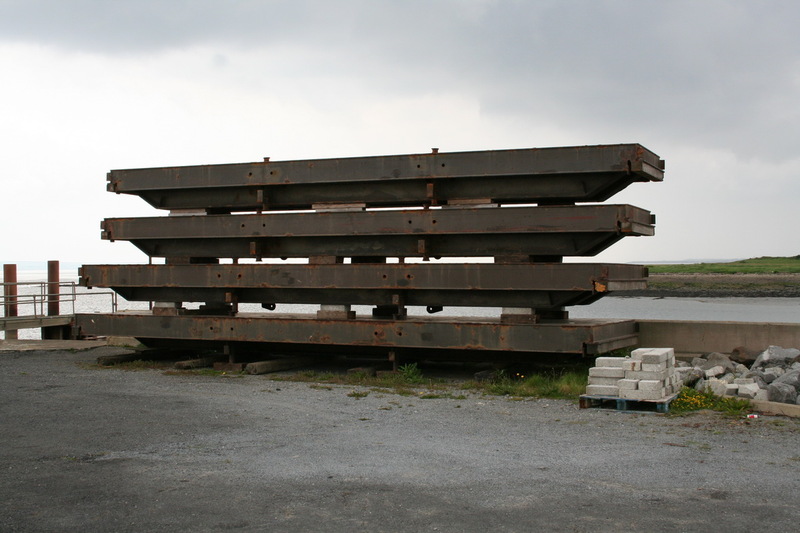 The Board of Fisheries have added 168 feet to it, which cost the sum of 1,800 l., but it is a substantial and well-executed work: this has been carried into four feet at low water, and therefore will only admit of a vessel lying alongaide at high water. 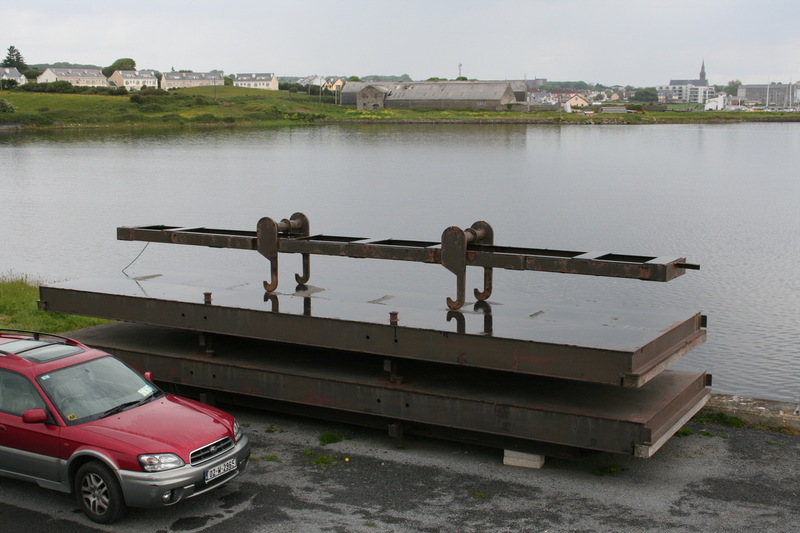 […] The extension of this pier would afford the means of the farmer having a more cheerful prospect of seeing his commodities get a speedy and safe conveyance to the markets; and since the establishment of the steam packet which now runs between Kilrush and Limerick, the extension of this pier becomes a matter of actual necessity, for at present all the cargo is obliged to be shipped by means of a boat, as the vessel cannot lie alongside for want of water. 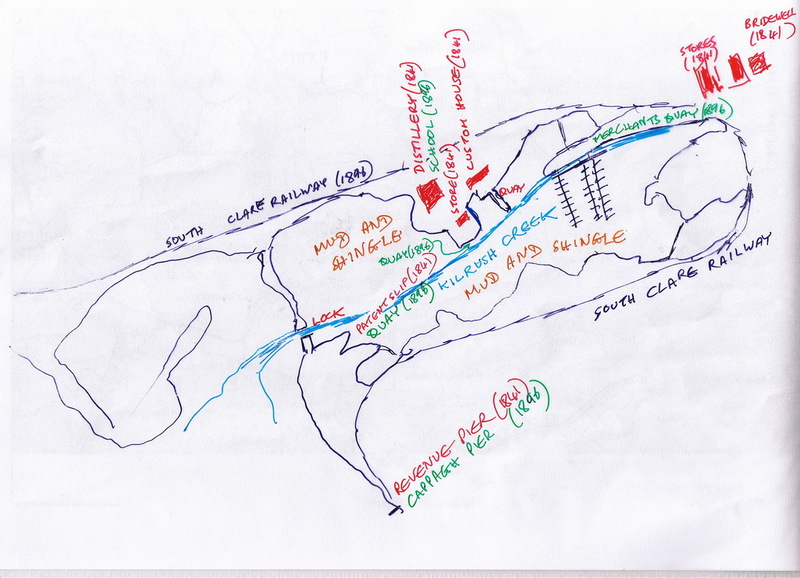 Here is a rough sketch map of Kilrush. This shows items that did not exist contemporaneously. 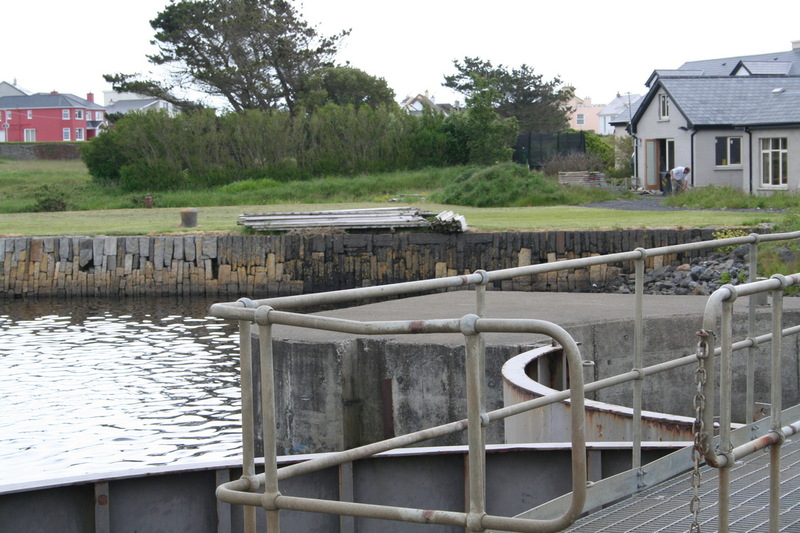 For instance, you can see the South Clare Railway curving around the harbour. It was owned by the same shareholders as the better-known West Clare Railway and the two were operated as one; the junction was at Moyasta. 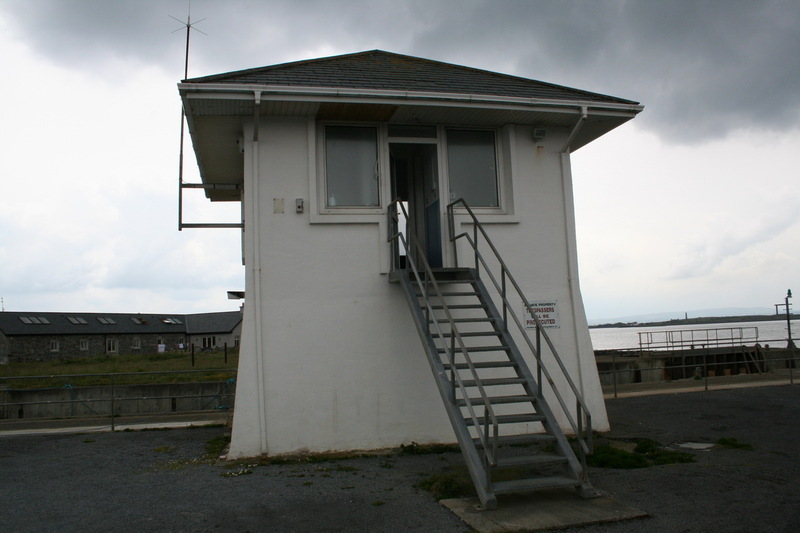 Operations ceased in 1961. 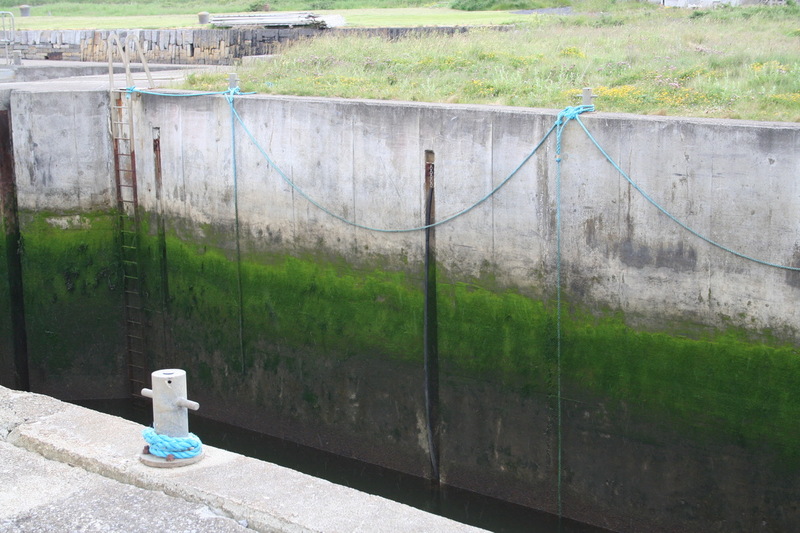 But the map also shows the lock and the embankment in which the lock is set: they were built as part of the marina development in around 1990 (I would like to know the year in which the marina was opened). 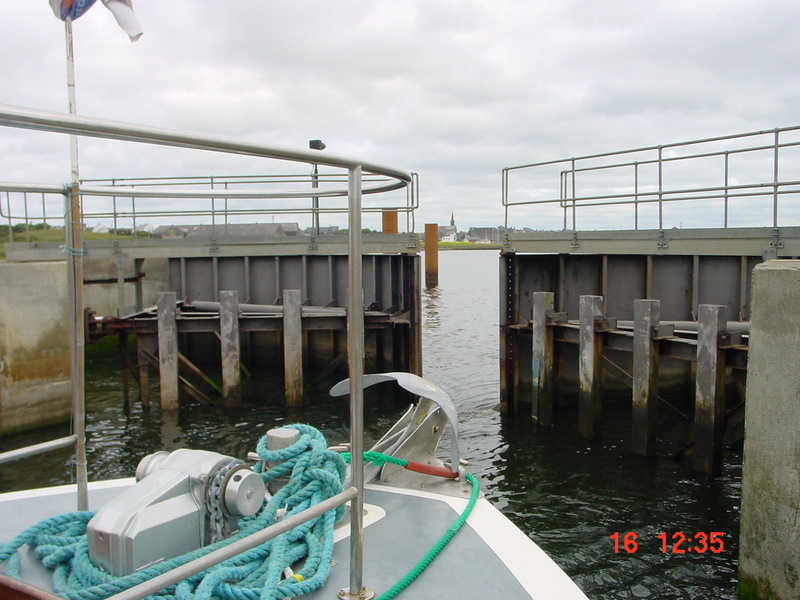 Similarly, the pontoon moorings came with the marina and were not there when the railway was operating. 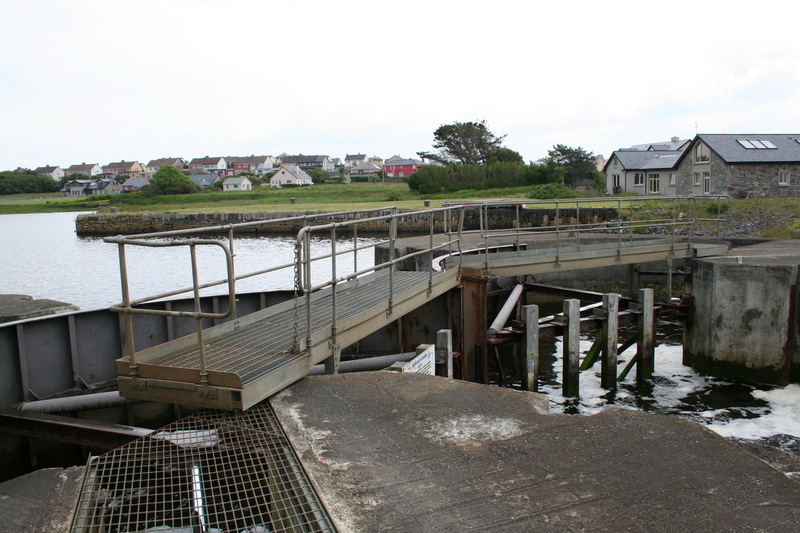 At low water, mud and shingle banks were exposed, leaving only Kilrush Creek (shown in light blue) for the ducks and the fish. So you can see why Mudge didn’t think much of Kilrush and why the steamers used Cappagh Pier, at the bottom of the sketch, rather than trying to get into Kilrush itself. 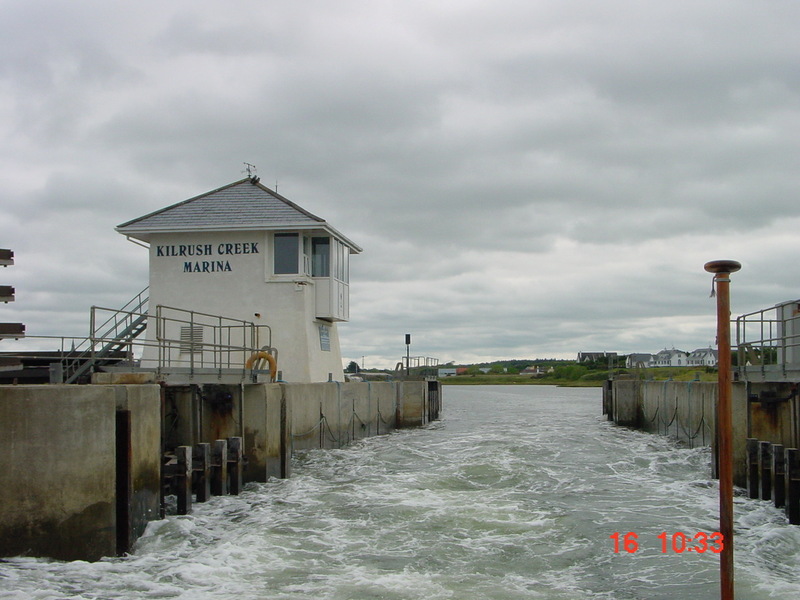 You can see two old quays touching the line of Kilrush Creek: one is wide, and has a store on it, and the other is narrow. 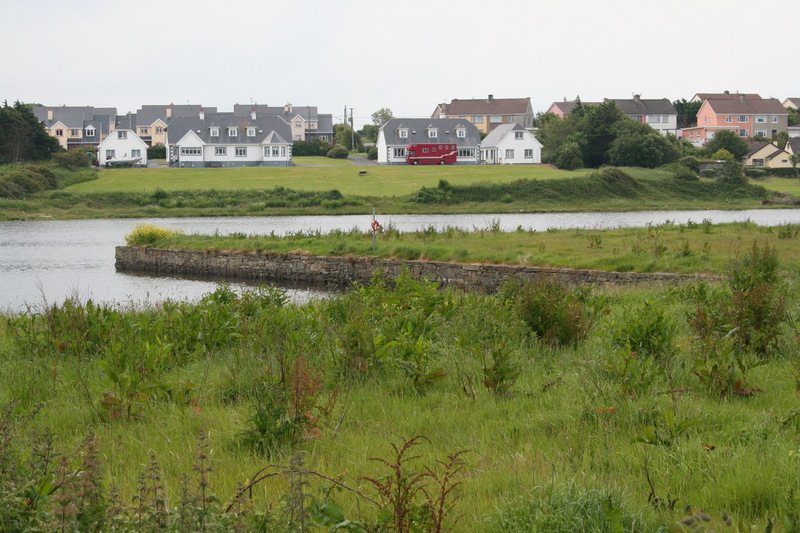 Here’s the wide one, photographed from the land (most photos on this page were taken in June 2009). 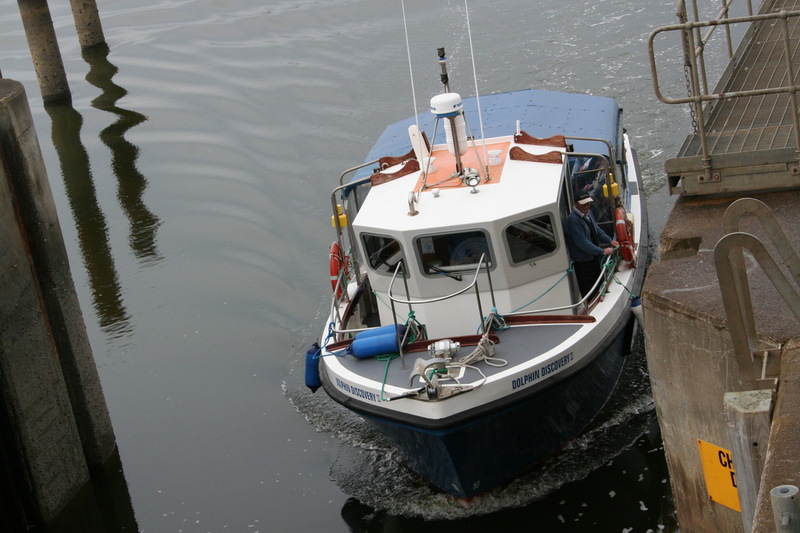 Here’s the narrow quay, seen from beside the current marina offices (the landward end of the finger pontoons). I don’t know what the walls and gateway were for, but the Custom House was at the head of this quay in 1841 so perhaps security was required. 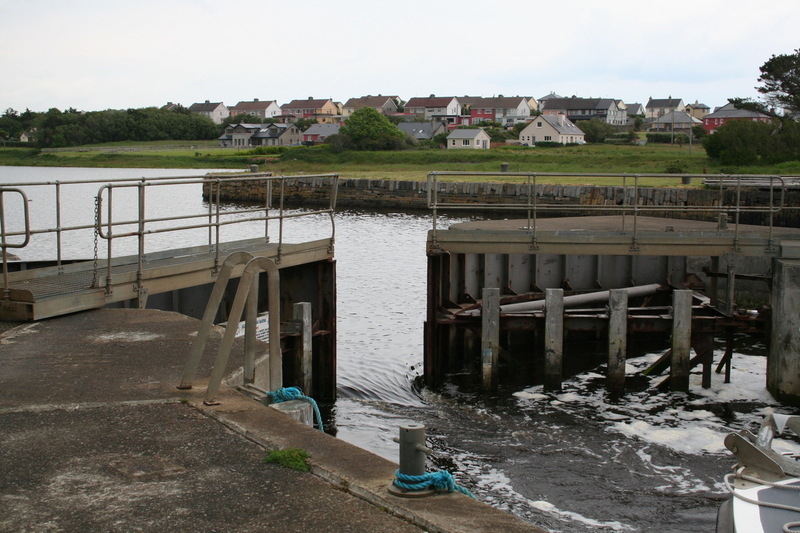 The white building near the left of the photo is the lockhouse; I’ll explain the white cylinder later. The building on the right is now a timber store; in 1841 there was a distillery there, and later there was a school. Up in the town (I’ve shown only the edge of it) were stores, some of which have now been converted into blocks of flats. 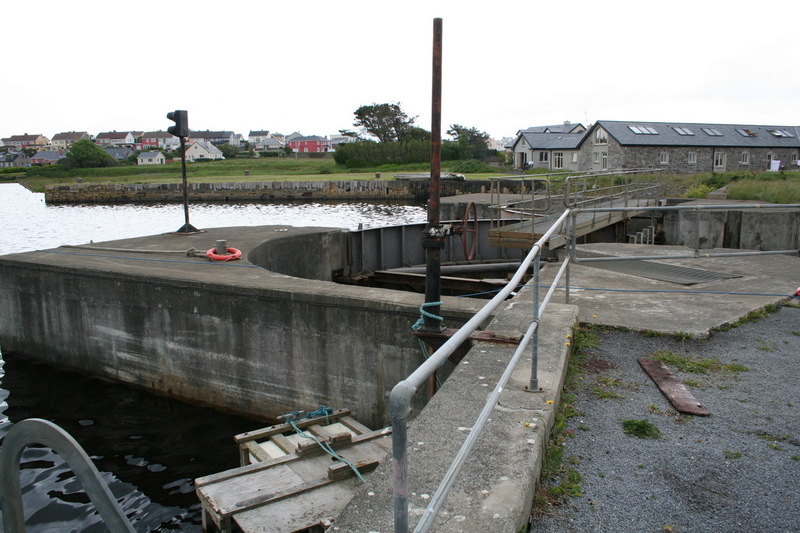 And there is another quay just beside the lock. In 1841 a patent slip was shown at this point, but by 1896 the quay had been built. You can see a bit of the lock in that photo; let’s have a more detailed look. 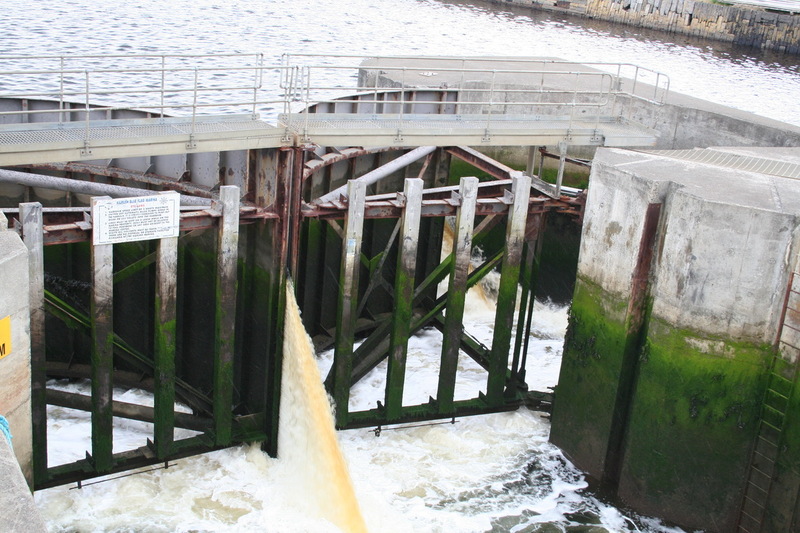 You can probably tell that this lock uses sector gates: there are two gates at each end of the lock and each gate is shaped like a quarter of a cylinder. 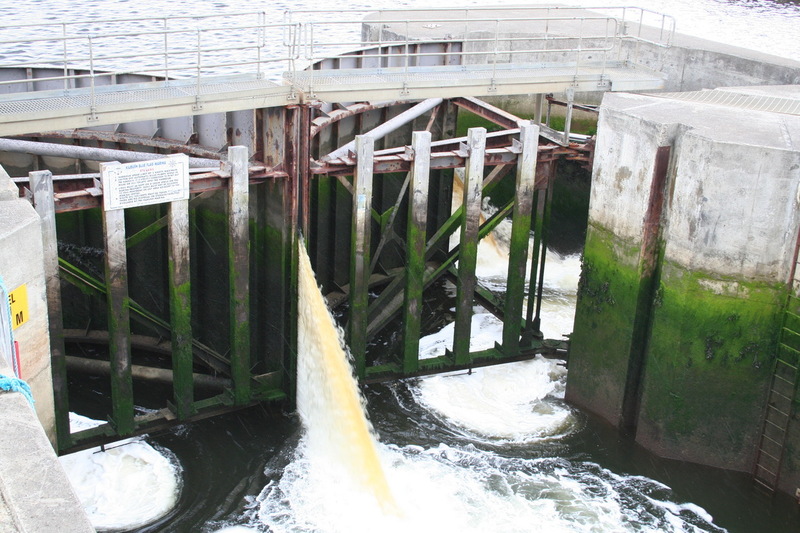 These gates are relatively rare in Ireland: they are being installed as flood gates at Spencer Dock in Dublin, where the Royal Canal joins the Liffey. British boaters will have seen them at Limehouse on the Thames and at Three Mills Lock on the Prescott Channel on the Bow Back Rivers (thanks to David Mack for the link and to Tim Lewis for taking so many photos). 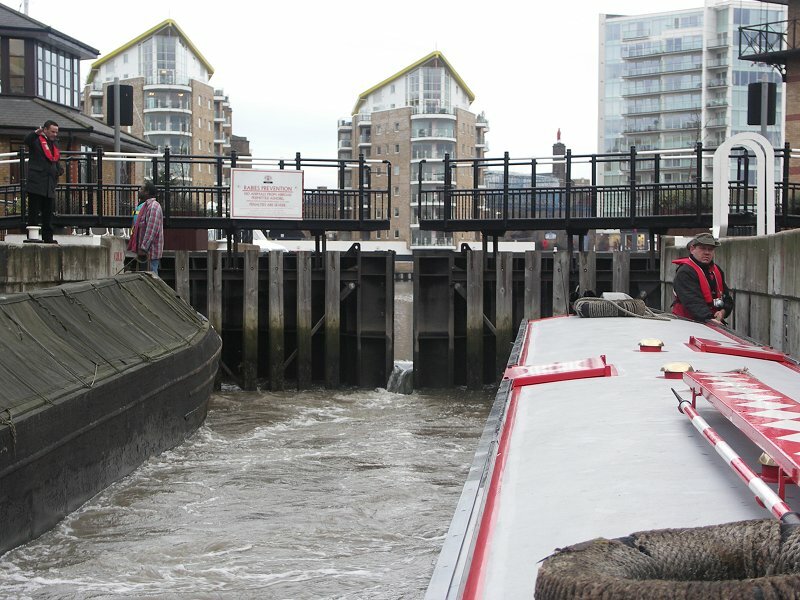 The lock is used to keep up the water level in the basin, so that boats stay afloat at all stages of the tide. 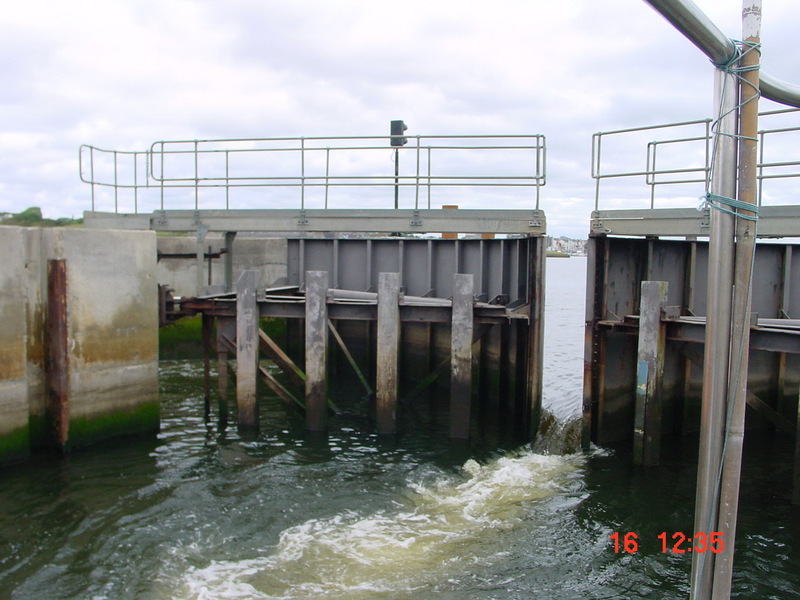 But when the tide is full the level can be the same inside and outside, so both sets of gates can be open. 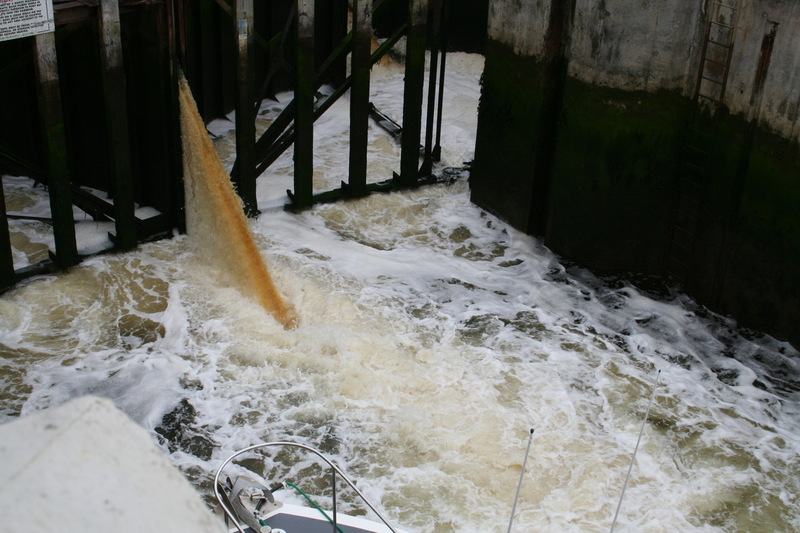 That’s what’s happening in this photo, taken from a boat leaving the marina in 2002. 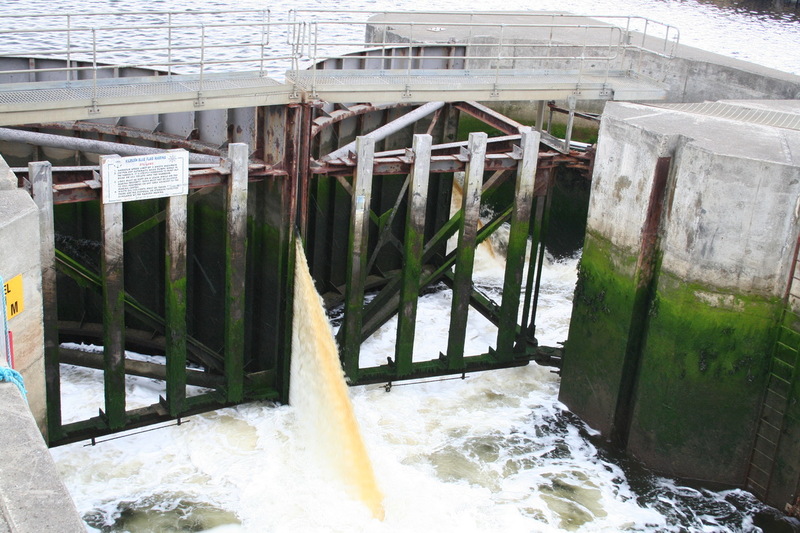 It gives a good view of the lock as a whole. Note the lockhouse on the left. The pole in the foreground is the dolphin-watching boat’s flagstaff. 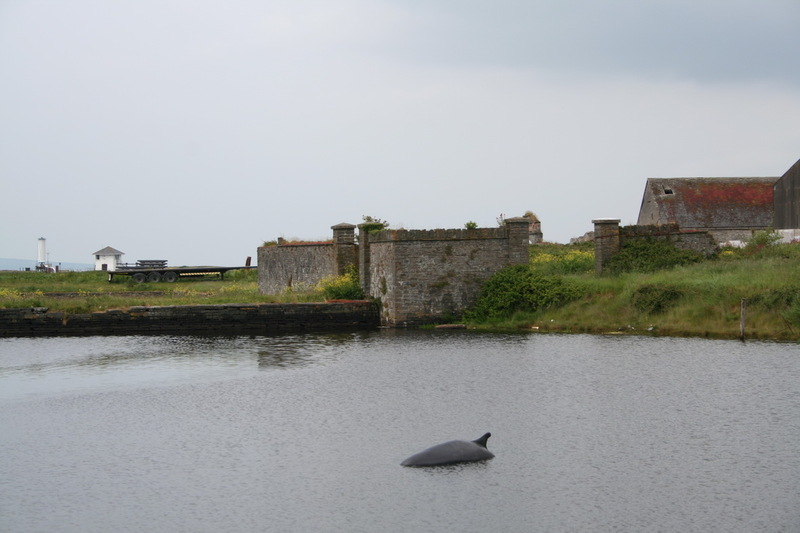 There is a resident group of bottlenose dolphins in the estuary and the Shannon Dolphin and Wildlife Foundation has its offices in Kilrush, where Dolphin Discovery (Scattery Island Ferries), one of the accredited dolphin-watching operators, is based. 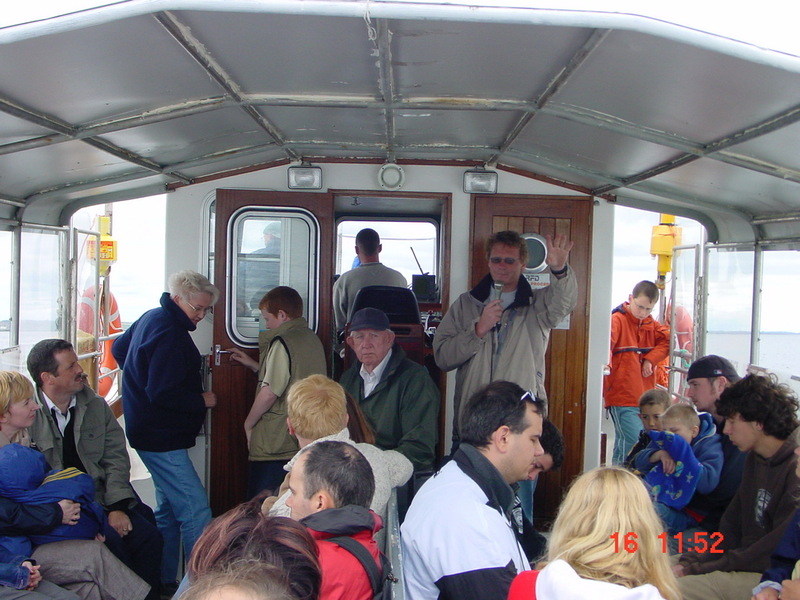 This is the Scattery Island ferry. And here is a poor shot of Scattery Island, which has a round tower and such. 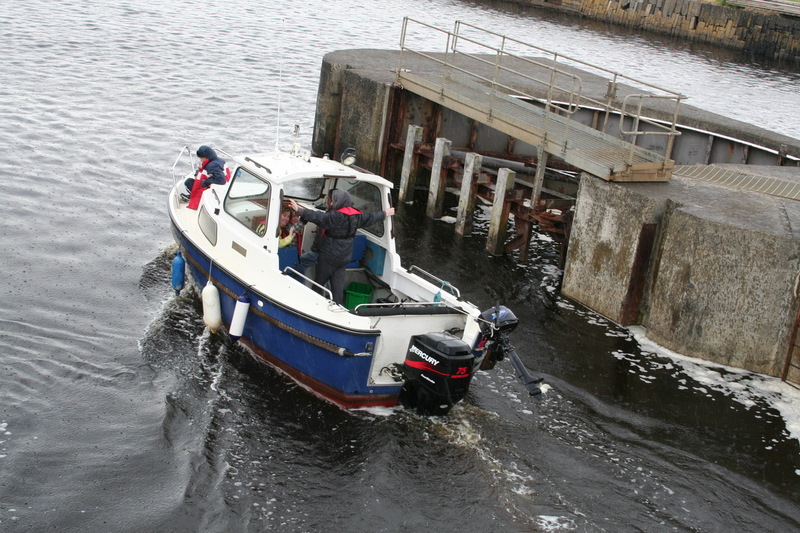 Families from the island provided estuary pilots; one of them owns the ferry and the dolphin boat. 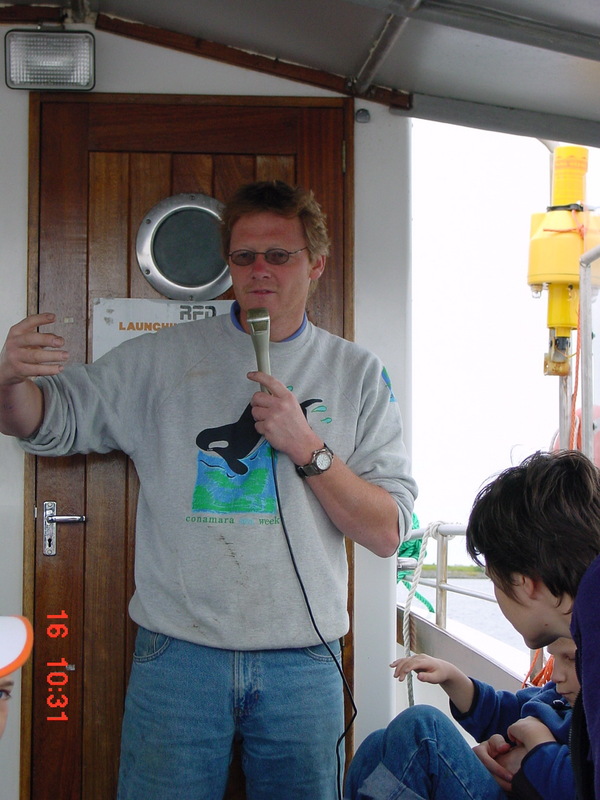 This is Dr Simon Berrow of the Shannon Dolphin and Wildlife Foundation. He doesn’t travel on every trip, but he happened to be going along that day and he told us a lot of interesting and indeed surprising things about dolphins. Anyone who goes swimming with these animals is a lunatic. Anyway, back to the lock. Here’s the lockhouse from the ladder side. 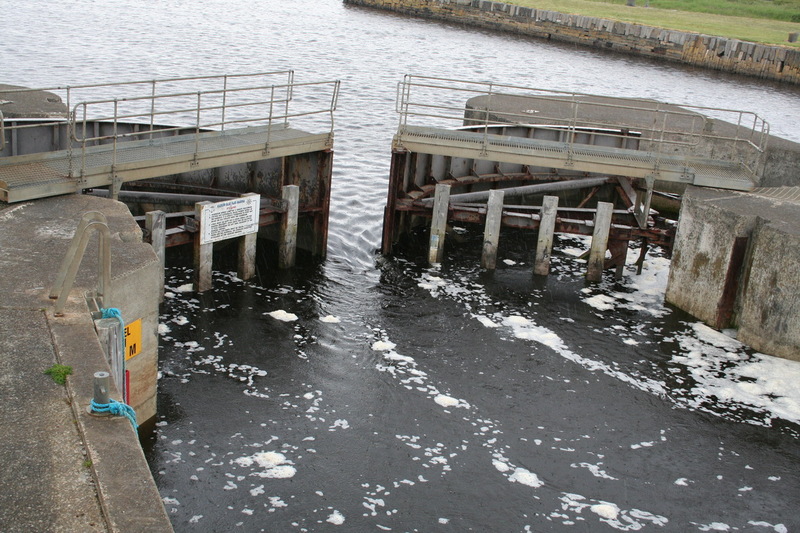 Here are the upper gates, seen from the control room in the lockhouse (by kind permission of John Hehir, marina manager). … and here is the other, with the lifting mechanism on top. 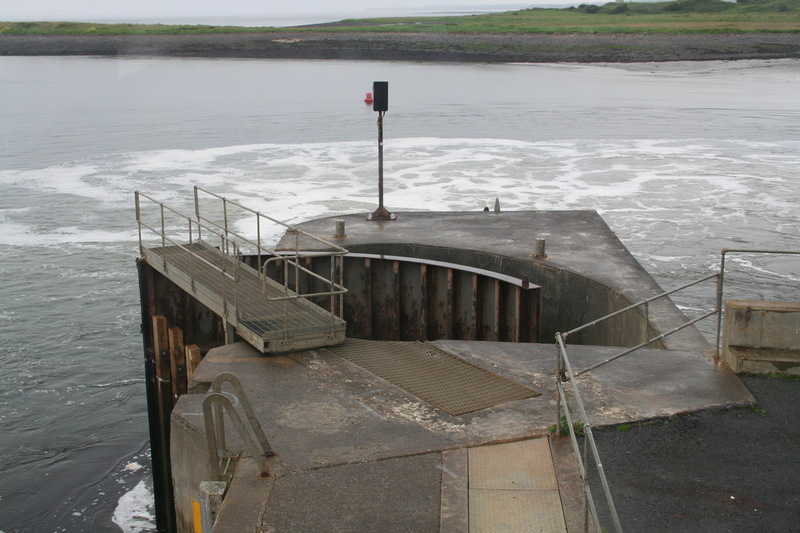 The lock uses a million gallons of water, which is the same as Ardnacrusha, but its cycle is much faster. The chamber is equipped with bollards, chains and ropes. The chains were installed ab initio, but it seems that most users prefer the ropes. I was glad to see that there are ladders too. 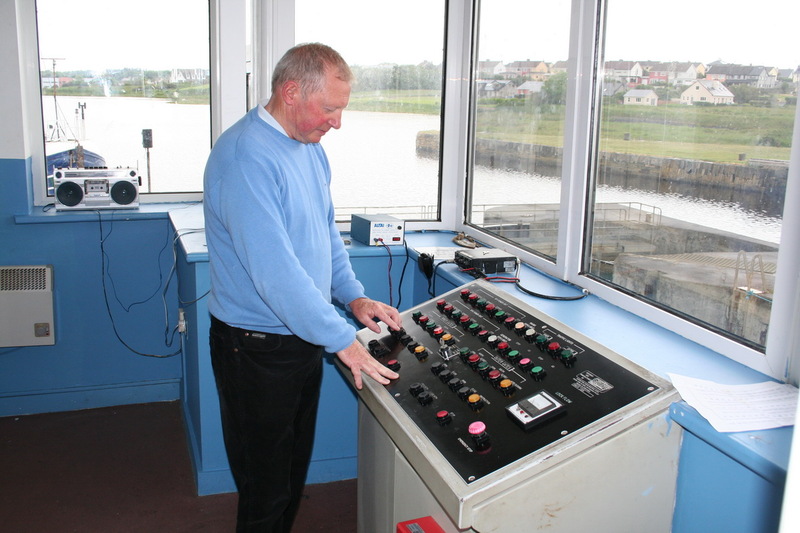 Here is John Hehir at the controls. The marina has new owners since 2014; see up-to-date information here. The gates have walkways across them. 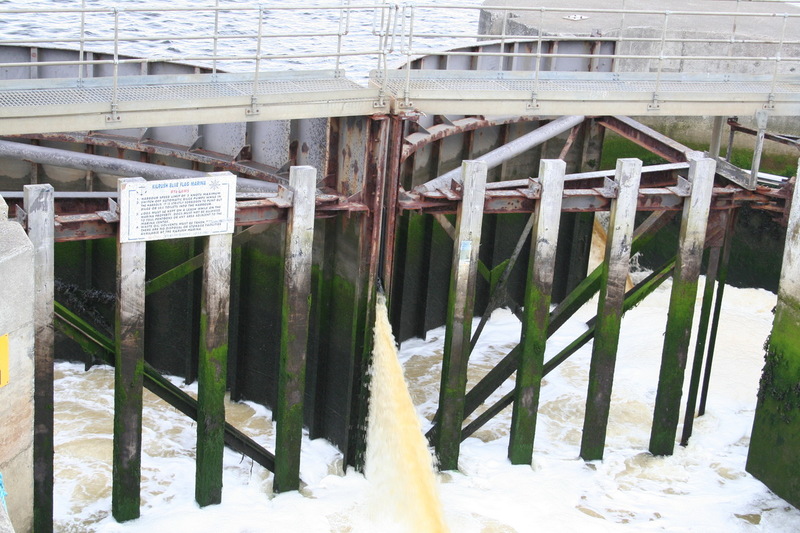 You can see the end of the hydraulic ram in that photo; here’s another view of it. 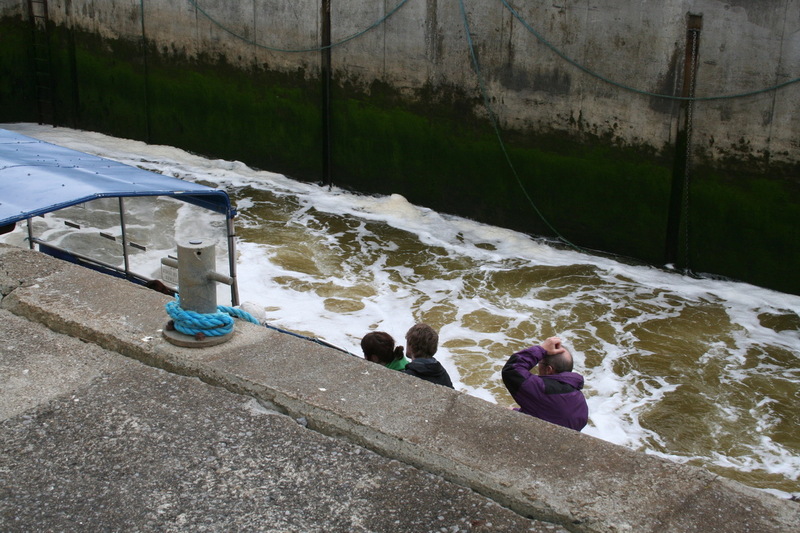 … but there is also a pipe providing a flow out of the marina. 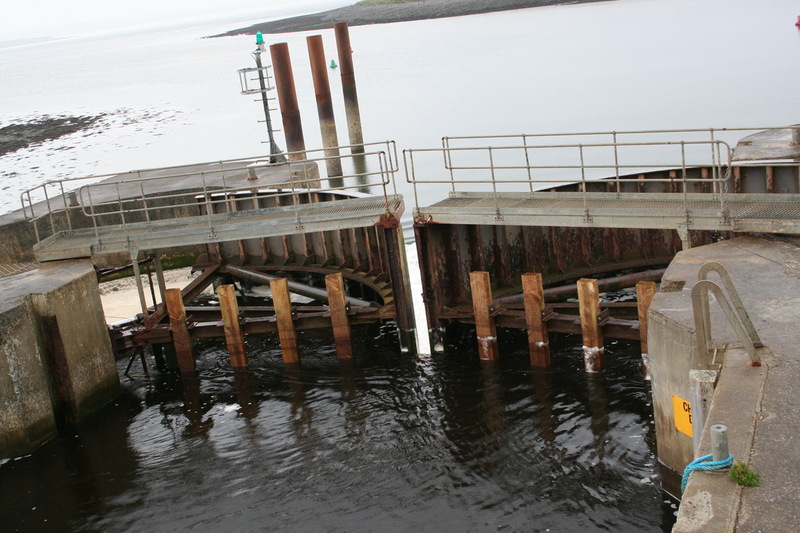 You can see the control wheel mounted on the nearer pole (I don’t know what the floating box is far) and there is a similar mechanism on the downstream side. 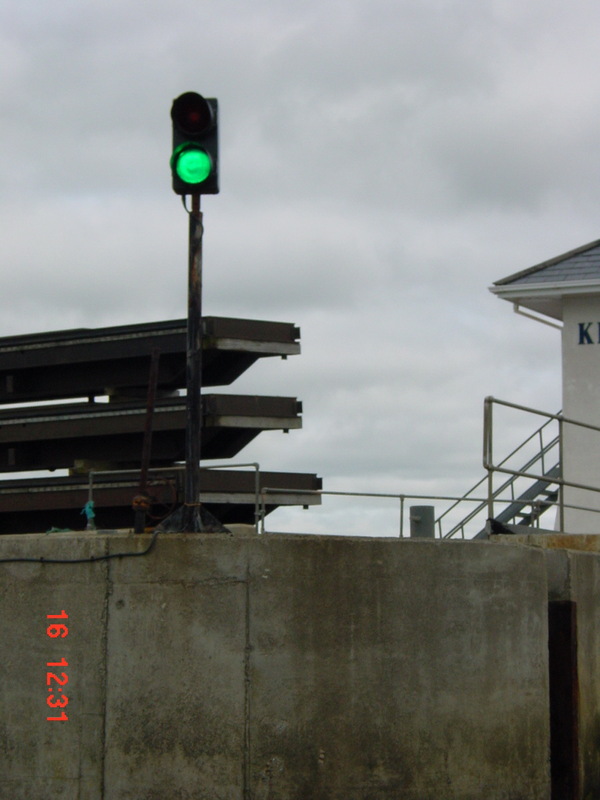 You can also see the traffic lights there. 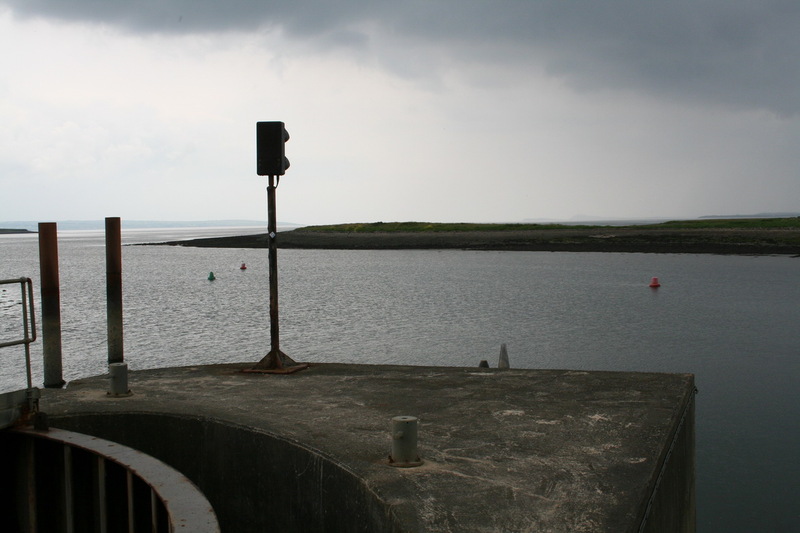 Here are the outer lights, seen from a boat (2002). What may not be immediately obvious is that sector gates don’t have racks (paddles). 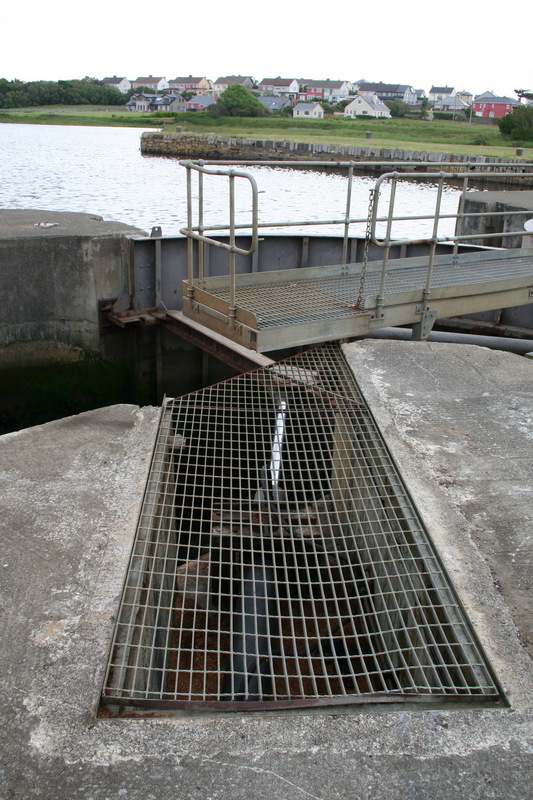 Water is let in and out by cracking the gates a little; the control panel has an appropriate setting. 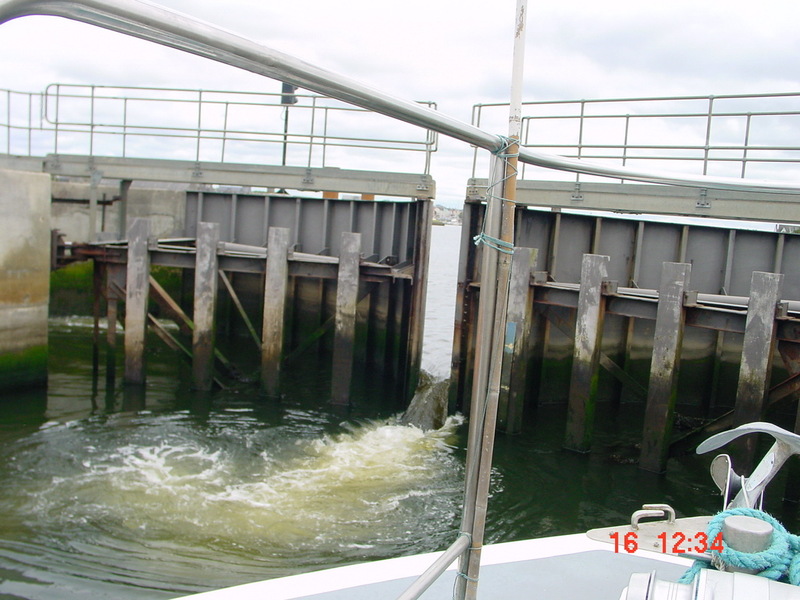 Here is a sequence of photos showing the upper gates letting water into the chamber. (The caption is a tribute to Traffic.) I suppose I should say that, if you’re not an anorak, you might like to skip this section. I mean, I think it’s very interesting, but sometimes I meet people who don’t. 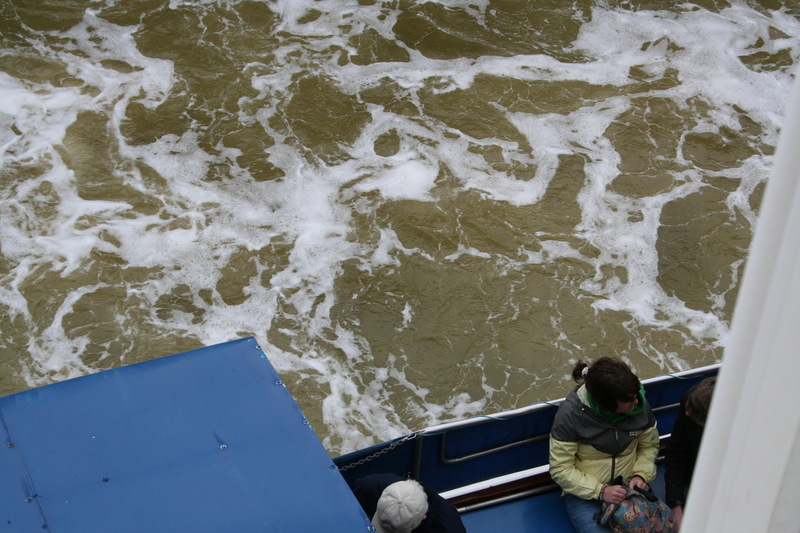 And here are two shots, from 2002, showing what it looks like from a boat. There now. Wasn’t that interesting? No? Oh well. 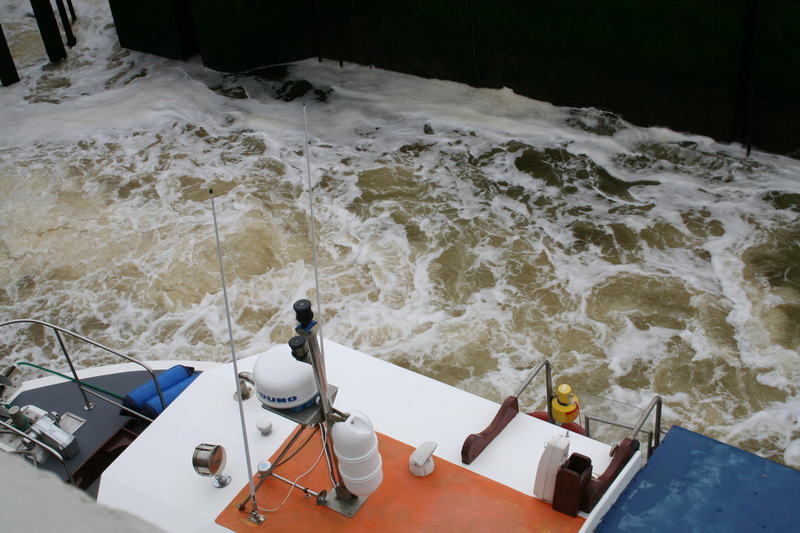 Once the chamber is full, the gates open and the boat proceeds. 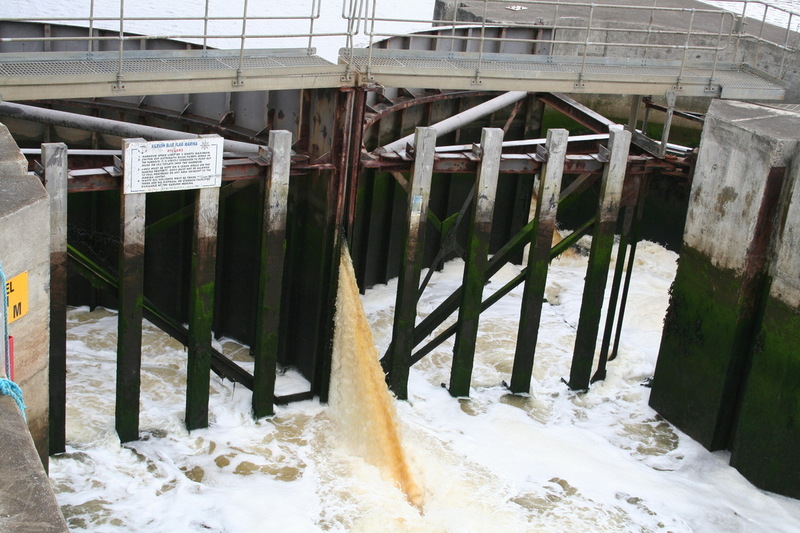 Note the amount of foam in the lock after it has filled. This next photo also shows the structure of the gates rather well. 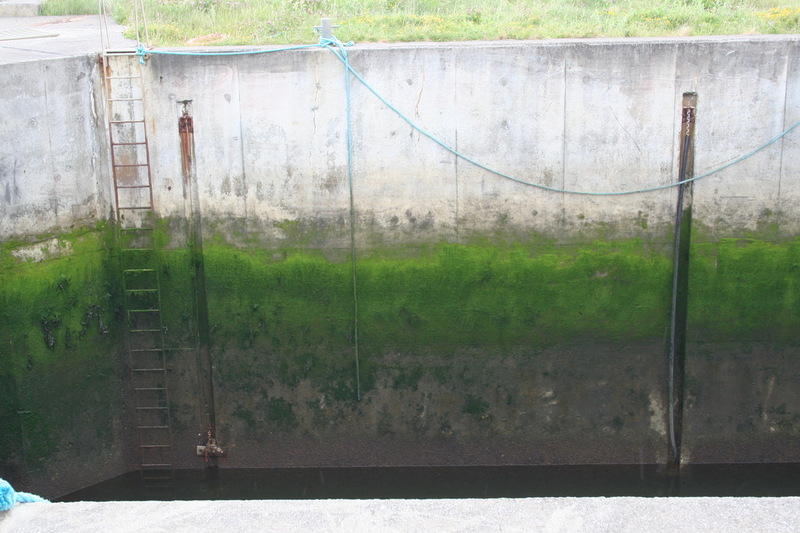 Once an incoming boat has left the chamber, the upper gates are closed and the lock is emptied. Again, you get a good view of the structure of the gates. The gates then open, withdrawing into their recesses. 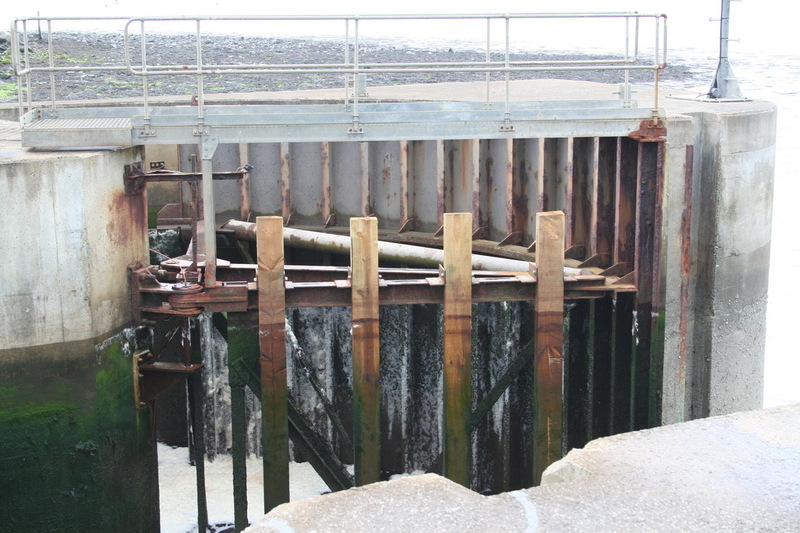 The lower gates have recently had work carried out: the seal underneath them has been replaced, as have the timbers. Furthermore, a support was fitted to take some of the strain off the upper hinges. You can see the bracket in the next photo, below the water level (ie on a background of green weed); you can also see the timbers. The upper gate timbers did not need replacing. 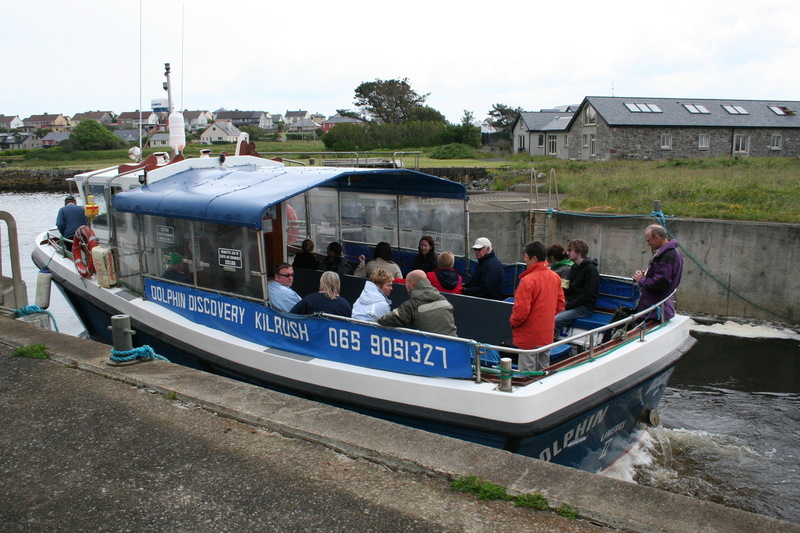 Just to conclude, let us watch the Dolphin Discovery II coming back from a trip. 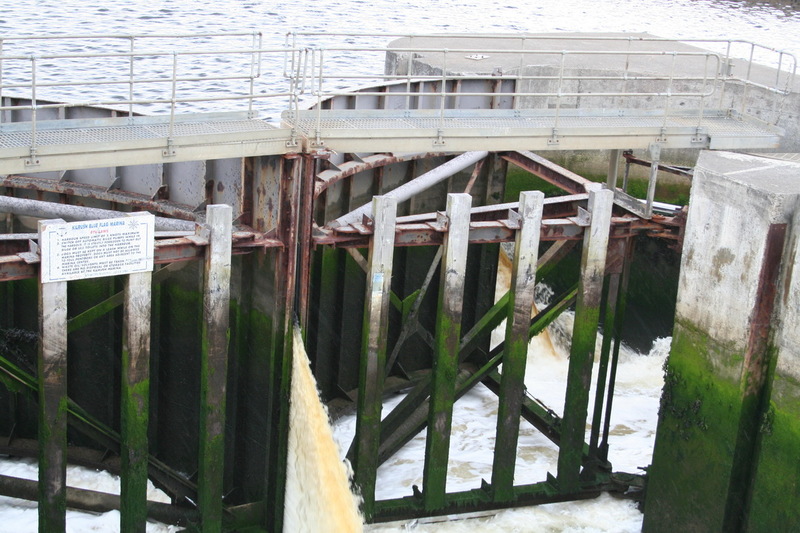 Next, the lower gates are closed and the upper gates are cracked to let the water in. Passengers looking interested … or worried? 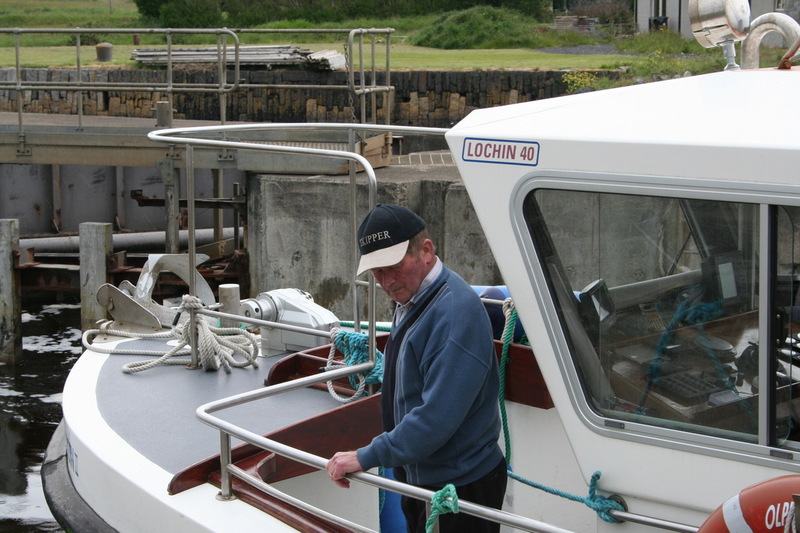 The boat is a Lochin 40, Lochins being serious seagoing boats rather than plastic soap-dishes with massive engines. But what about the white cylinder? What white …? Oh yes. I remember now. 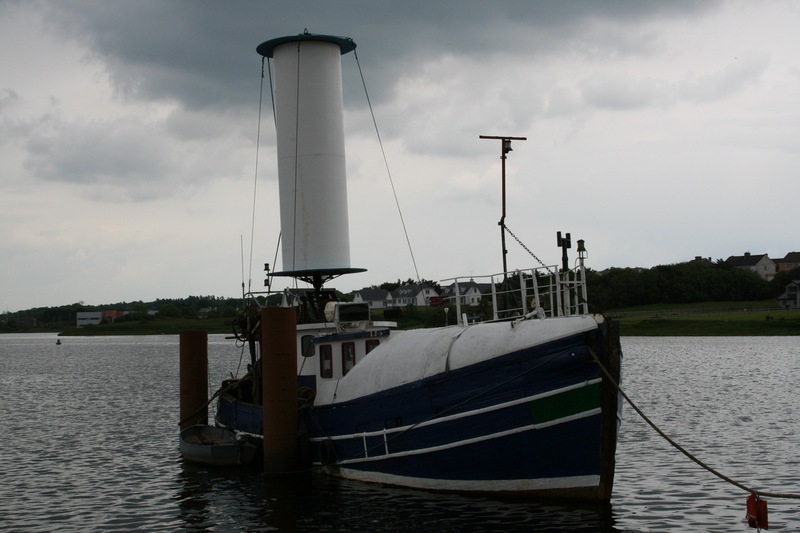 This is a fishing-boat with a prototype of a new wind-powered propulsion (or auxiliary propulsion) system, designed to save fuel. I understand that the designer is a Dutchman. 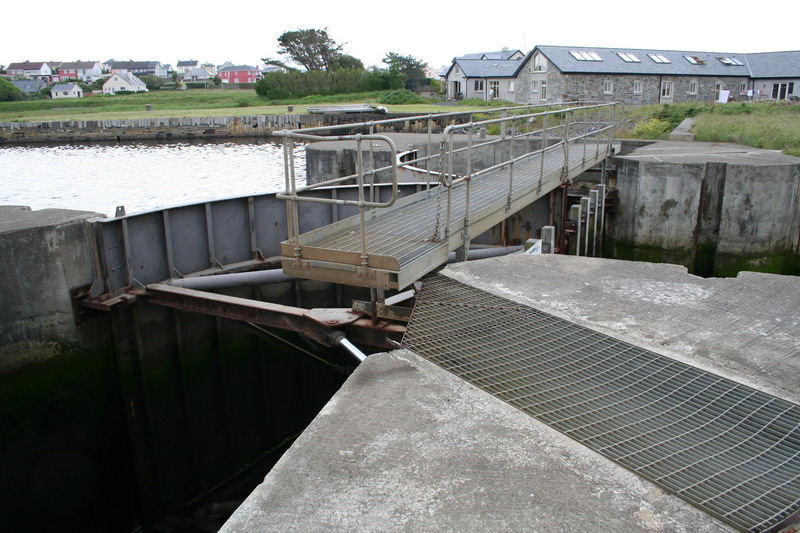 Here, by the way, is a page about some interesting operations from the slipway at Cappa Pier, whence a landing craft carried equipment to Hog Island. 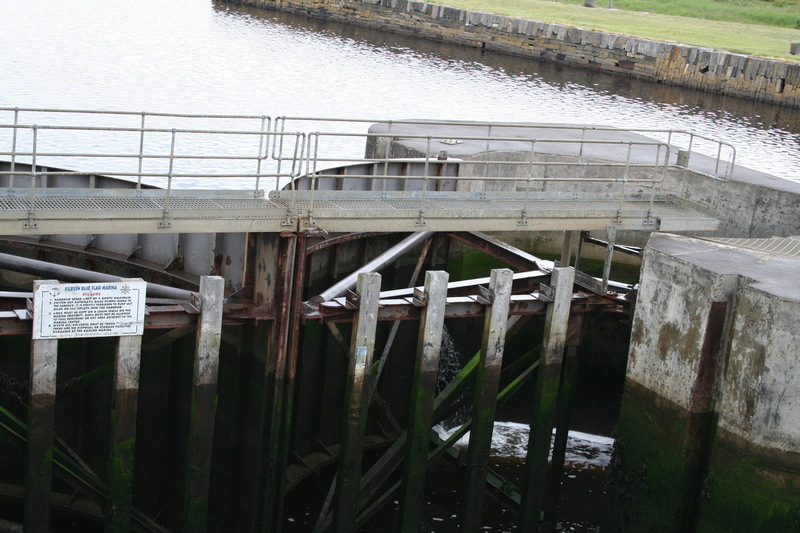 There are sector lock gates on the little known lock installed on the River Wansbeck in the mid 1970s in Northumberland so creating the northernmost inland navigation in England. I have photographed it more than once. It lies directly underneath the A189 Spine Road bridge east of Ashington. 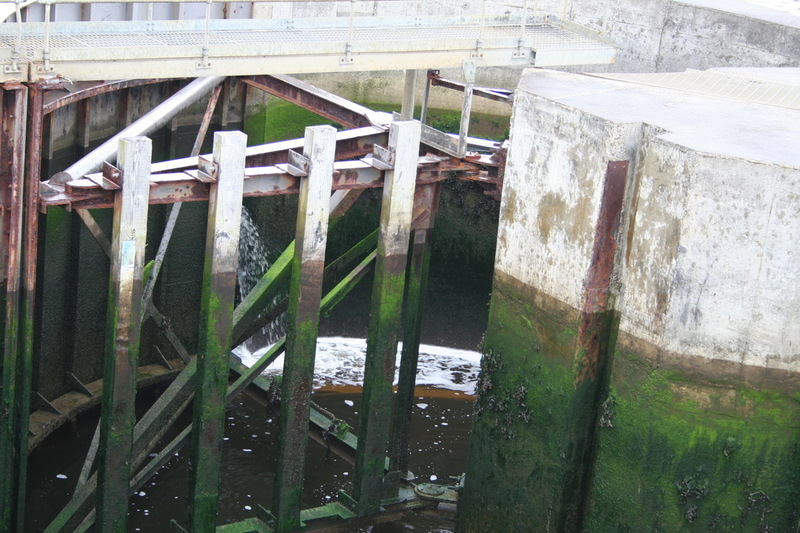 I think that the lock gates at Hartlepool Marina are the same. They are handy where the level differential is not consistently one way. 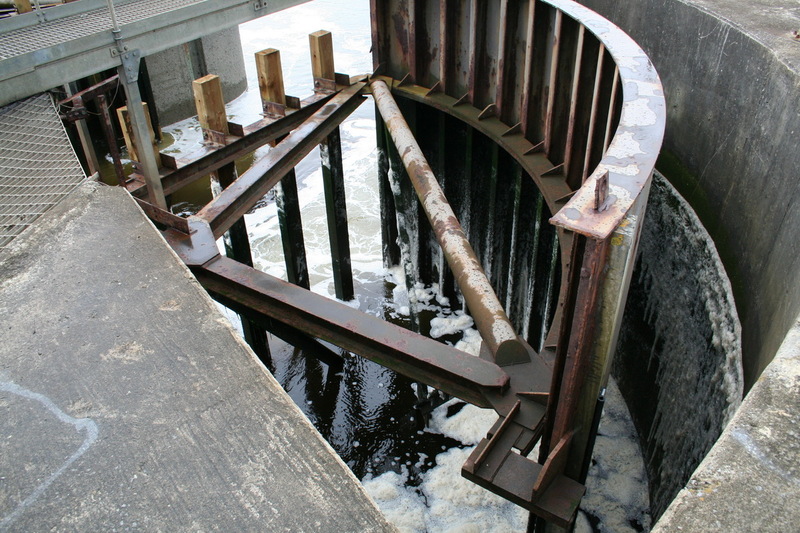 A variation on the theme are radial guillotine gates (not vertical plates). 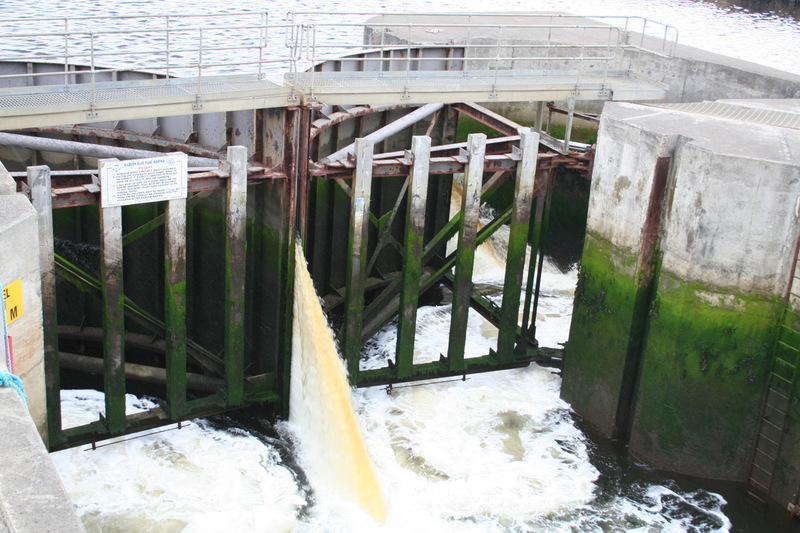 As I remember from when I was younger Ditchford Lock on the River Nene has these.